copacetic zine - where are they now? · yay target, pt 2! Magnet recently had a cover story on the history of shoegazing, featuring such bands as Ride, Lush and My Bloody Valentine. But one shoegaze band I love that was left off the list was Kitchens of Distinction. My oft-mentioned friend Becky and I both held worn-out copies of their 1991 release Strange Free World dear to our hearts. The Kitchens were three sly men from the Netherlands with a wicked sense of humor. (They would say things to the press like they had met in a Turkish sauna, or a satanist temple in Amsterdam.) Their first single, "Last Gasp Death Shuffle", was an NME Single of the Week. Riding along the sonic waves of the Shoegaze movement, Kitchens of Distinction went on to release four albums from 1989 to 1994. What made KOD really stand out from the other swirly-guitar bands coming out of the U.K. at the time was the powerful, poetic lyrics of vocalist/guitarist Patrick Fitzgerald, who was openly gay at a time when that was still uncommon. 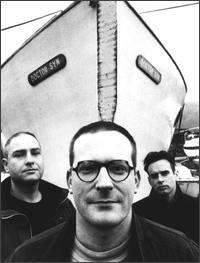 The band broke up in 1996, "exhausted and daunted" as it says on Patrick's website. And, according to the Voyager site listed below, drummer Dan Goodwin says that a reunion is not likely, adding "the three of them have been through enough sh*t for one lifetime without the need to do it again." However, it's also noted that Patrick and Julian Swales (guitars/vocals) have been collaborating on re-working some of the later K.O.D. songs with a female vocalist. Not sure if any of that is still on the plate though. Meanwhile, Patrick has continued to be quite busy. He went on to such music projects as Fruit, featuring guest vocals from Isobel Monteiro of Drugstore and Miki Berenyi of Lush. 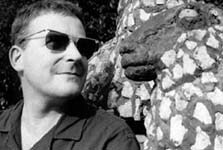 He also formed Lost Girls, a project with 4AD recording artist Heidi Berry. But, most currently, he is recording under the name Stephen Hero. In fact, Julian even helps out on this one. Apparently, the sound isn't too far removed from what we once knew with KOD, and Patrick's lyrics and vocals are stronger than ever..
 Kitchens of Distinction - A Voyager Website A wonderful fan site.  The Death of Cool Another great fan site.  Identity Theory A wonderful piece about the openly gay subject matter in KOD's songs.